About a one hour drive from where we live is a beautiful place called Nelson Bay. It has a bustling collection of beachside restaurants along the most fabulous white sandy beaches. When we came over to Australia in 2003 for my brother Joe's wedding we came to Nelson Bay for three nights after the wedding to chill out. We ate in one of the small pizzerias and had a bottle of wine. Then we walked back along the beach to our accommodation and had that fatefull half tipsy conversation: "Are you thinking what I'm thinking?!" The conversation that sparked an idea - that grew into a dream - that became a reality - that is now our life "Down Under"
Not surprisingly we try to jump into the car every now and again to revisit Nelson Bay and its surrounding area. This weekend Rhiannon was invited to a party in the Australian Shark and Ray Center, 15 minutes from our fondly remembered pizzeria. We dropped her off and carried on driving expecting to have a quiet wander and a coffee. We arrived into the gastronomic hustle and bustle of the Nelson Bay Food Festival. All around us were white marquees offering wines and foods to suit every palate. Thai noodles, BBQ'd king prawns, Organic fruit juices, Nuts, nuts and more nuts! After ravaging a bag of honeyed cashews we found a stall selling ready made picnic platters for $20. 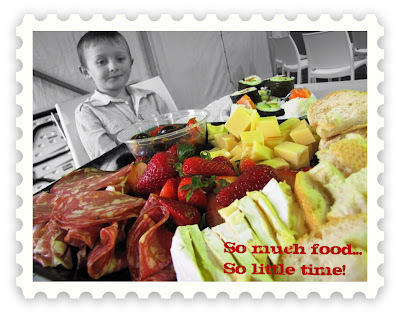 We chose one with half a French stick sliced up, strawberries, olives, sundried tomatoes, salami, parma ham, Camembert and Jarlsberg cubes. Coupled with a $15 tray overflowing with a selection of Sushi and we had a picnic fit for a king! Gareth is a foodaholic. He seemed frozen as he stared at the tray not sure what to tuck into first! We rolled out of Nelson Bay a few hours later, unable to eat or drink another thing! We headed back to collect Rhiannon knowing we will be putting the 2010 Food Festival in our diaries for a return trip! Wish i knew about this... maybe next year! Good for Gareth, boys can be quite fussy eaters so it's great that he has great taste buds! Firstly, that pic is amazing, your photography skills are brilliant. Secondly, that food festival sounds like my kind of heaven. There seems to be so much to do over there, your family is having a great experience. Fair play to you.